FRAMINGHAM, Mass. November 29, 2017 – According to a new forecast from the International Data Corporation (IDC) Worldwide Quarterly Mobile Phone Tracker, overall smartphone shipments will steadily grow from 1.5 billion units in 2017 to 1.7 billion units in 2021. Meanwhile, phablets (smartphones with a screen size of 5.5 inches to <7 inches) will far outpace total market growth by climbing from 611 million units in 2017 to 1 billion units in 2021, representing a five-year compound annual growth rate (CAGR) of 18.1%. In comparison, the total smartphone market is expected to grow at a 3.0% CAGR during the same period, while normal smartphones (under 5.5 inches) will decline 7.4%. Overall, IDC lowered its previous forecast for 2018-2021 by 1.1%-1.5%,depending on the year. The largest changes came in the China and Middle East & Africa regions, which are still expected to grow through 2021. 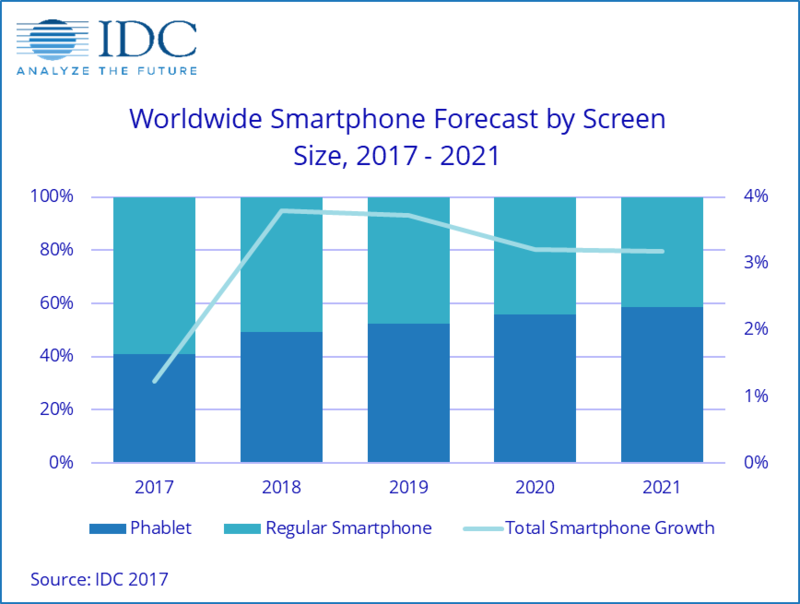 Android-based phablets have been the primary driver of large-screen smartphones and IDC expects this trend to continue in the years to come. Samsung's early dominance of the phablet category has been short lived as other OEMs – many of which are Chinese OEMs - quickly pushed the category into the mainstream and even low end. As a result, China consumed 50% of the 437.4 million phablets shipped in 2016. IDC expects China will remain the largest market for large-screen smartphones and to grow at a CAGR of 12.6%. "In 2012, phablets were just 1% of smartphone shipments and now they are approaching 50% of the market just a few years later," said Ryan Reith, program vice president with IDC's Worldwide Quarterly Mobile Device Trackers. "The rapid transition to bezel-less smartphones will help minimize the device footprint while growing the screen size from previous generations. Consumers continue to consume more video entertainment, gaming, social media, and other data-heavy applications on their smartphones making the display size and type a critical factor in smartphone buying decisions." Apple has also made a massive push into the phablet space and IDC expects its Plus and X devices to account for 41.2% of its shipment volume in 2017 and 50% or more of Apple's iPhone shipments in 2018. If the recent rumors of new, larger screen iPhones in 2018 hold true, then this number will likely grow further as a share of its overall shipment volume. "There is no doubt that 2017 gave birth to the new ultra high-end segment of the smartphone market," said Anthony Scarsella, research manager with IDC's Worldwide Quarterly Mobile Phone Tracker. "The latest flagship devices from Samsung, Apple, Google, LG, and others has pushed the high end to the $850-plus level for the first time. Despite these price hikes, consumers look as if they are willing to swallow the cost just to have the latest and greatest device in their pockets. Although many consumers may not be able to afford these devices in more price sensitive markets, programs such as device financing combined with trade-in policies are making these devices more attainable to buyers in a number of markets. This growth at the ultra high end translates to higher average selling prices (ASPs) for smartphones throughout the forecast period. By 2021, the last year of our forecast, smartphones will reach an ASP of $317, up from $282 in 2016, representing a CAGR of 2.3%." Android: Android-powered smartphones have already captured 85% of total market volume and IDC expects this share to remain relatively stable throughout the forecast. What has changed is the vendor landscape with OEMs that have more market history feeling intense pressure from a range of up and coming vendors focused on tight inventory control and new go-to-market strategies. Despite Android smartphones having such a high share of the market, volumes are still expected to grow from 1.3 billion in 2017 to 1.5 billion in 2021, which represents a five-year CAGR of 3.2%. iOS: Apple's launch of the iPhone 8/8+ and X in late 2017 set the company up to return to iPhone volume growth in 2017. IDC expects an even bigger rebound in 2018 as channels fill up with inventory of the new models and as price cuts around earlier models enable it to hit lower price points. Coming off the 7% decline in iPhone shipments in 2016, IDC is forecasting growth of 2.4% in 2017 and 8.1% in 2018. IDC also projects sustained growth for Apple through the later years of the forecast with volumes growing at a five-year CAGR of 3.1%.